One way to get a grip on your ponds snow-melt issues is to use a modified marking system. It will allow you to accurately measure your ponds water level with merely a glance. There are several different types of depth markers available. You will want to select one that will not puncture a hole into your pond liner. In many cases, that may end up being a side-wall or sloping marker system. While we are on the subject of punctures, it is important to use protective padding when installing pond agitators and pump systems too. Thats because such systems tend to have sharp edges that can sometimes cut into a pond liner with continuous use. It is also a good idea to monitor the ponds embankment area for signs of erosion. Otherwise, the banks could erode to the point where it disrupts the placement of your pond liner. In instances of significant erosion, pond liner damage could also occur. Erosion is not the only thing to look out for around the embankment area. Roots from trees and shrubs as well as loose, vegetative debris can cause problems too. Therefore, it is best to avoid planting in the areas near thecontainment pondand engage in periodic tree limb removal. Lastly, consider protecting yourpond linerfrom migrant waterfowl with the aid of weather resistant netting. The netting should be ideally place above the pond and on poles. It should also feature large openings and a support cable designed to keep the netting free of wintry debris. Failure to keep the net free of ice, snow and other materials could cause it to collapse and damage your pond liner. For more information about pond liners and how to use them, pleasecontact us. 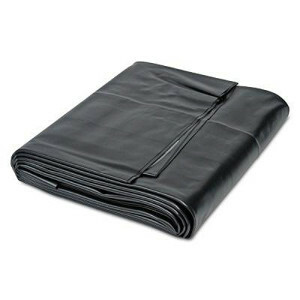 We have a large assortment of 20 mil pond liners in stock. They feature a puncture resistance of 140 pounds and a tongue tear resistance of 80 pounds. Their Mullen burst strength, hydro-static resistance and grab tensile strength are also quite impressive. This entry was posted in polyethylene tarp, pond liners and tagged containment liners, pond liners on December 5, 2013 by CanopiesAnd Tarps.